Fantastic graphics and heroic music. Fast and responsive touchscreen controls. Interesting combination of shooting and endless runner mechanics. Includes a whole lot of cool WWII-era weapons. Too many maps get reused too often. Most of the equipment is very expensive to purchase. The day is June 6, 1944. This day is likely going to be the most important one in your life so far. All your training and experience has been honed to perfection for this precise moment. You’re just one of many American soldiers stationed on a ship that is about to commence the Allied invasion into France during the most heated period of WWII. The battles ahead will not be easy; the German army is one of the most fearsome in the world. Beating the Nazis and getting through this ordeal in one piece will require you to know many things. You need to know when to shoot, when to run, and when to hide. Make so much as one slip-up, and not only will you be dead, but you may very well cost the Allies their victory. Keep your head on, figuratively and literally, and be careful. You’re a Frontline Commando and this is D-Day. 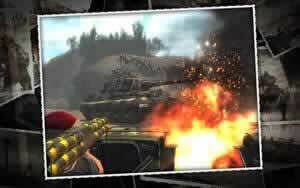 Frontline Commando: D-Day is a game that harkens back to the classic arcade shooters of old. From the moment you take your first step off the boat and into the battlefield, you’ll enter a world on your mobile device where shots are fired from every angle and death could be around every corner. The only way out is forward, and the only way forward is to be a crack-shot with your gun. Watch the action unfold with state-of-the-art 3D graphics and against the backdrop of a heroic orchestral score. Take aim and fire with simple, responsive and intuitive touchscreen controls. Zoom in your view to hit distant targets with greater ease. Shoot enemies from behind cover. Wait for them to pop up and fire before they get a chance to hit you in turn. 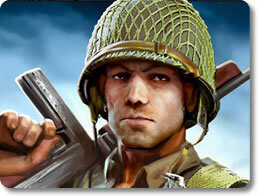 Fire a variety of WWII-era weapons, including machine guns, long-range rifles, rockets launchers and more! Score headshots to drop enemy soldiers quickly. Dodge landmines and other hazards as you dash from one hiding spot to the next. Features environmental destruction. Eliminate sandbags and barricades to expose bunkered-down soldiers and make them easier to shoot. Frontline Commando: D-Day isn’t like the average casual game that can be finished in an afternoon. It presents a challenging and lengthy story campaign that will see you through to the end of the D-Day invasion. Proceed through five campaigns, each of which represents a different sector in the Normandy landing: Juno, Sword, Gold, Omaha and Utah. Achieve bonus objectives littered throughout every mission. Get a minimum number of headshots, finish the mission in record time, and more. Earn gold for a job well done. Spend it at the in-game store to buy new weapons and ammo. Frontline Commando: D-Day stirs up platform conventions like no other. It will push your mobile device’s graphical capabilities to the max as it puts you into its fully-realized war-torn world. Violence, gunshots and explosions are everywhere. Enemy combatants lurk around all corners. Cities burn with the fires of war and the action never lets up. If you want to experience an epic adventure that can be enjoyed in bite-sized chunks of time, then sign up as a Frontline Commando with D-Day today. It’s a decision you won’t regret. World War II used to be the go-to setting for the shooter genre, but it seems to have tapped out for the past few years. 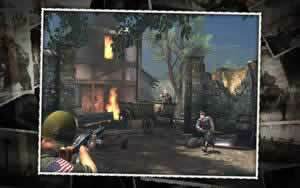 Fortunately, those who miss the setting or missed the boat entirely can now try it out with Frontline Commando: D-Day. There aren't a whole lot of games that deliver fast and furious shooter action for the mobile platform, but this game proves that it can be done. Your eyes are not deceiving you. You're not looking at a commercial military shooter for the PC or console; you're looking at a genuine free-to-play mobile game with touchscreen controls. While they might look outdated when compared to more modern games, they nevertheless blow the visuals of most mobile games straight out of the water. The characters are animated very well and they have enough detail to hold up upon close inspection, stony facial expressions aside. A lot of care was also taken in making the environments feel like brutal war zones. You'll run through trenches, duck behind sandbags, narrowly dodge mortar blasts, and watch as fires burn in the distance while emitting dark plumes of smoke into the air. Bombers fly in the sky, tanks roll out with crushing force, and both erupt into flames when they are destroyed. Bouts of shooting are punctuated by brief but intense feelings of panicked movement as your soldier rushes from one area of cover to the next. While the levels might start to blend together after extended play, they do a great job at simulating the feeling of being at war. The sound design is similarly well-done. Every gunshot and explosion sounds authentic. Enemy soldiers shout orders to each other in harsh German tones. On top of it all, the game is backed by an intense soundtrack that was composed to capture a harsh but heroic feeling. In short, every element of Frontline Commando: D-Day's presentation does the job of putting you in a Nazi-shooting mood exquisitely. Props should definitely be owed to it on this front if you'll pardon the pun. If you were to look at any trailers or gameplay videos of Frontline Commando: D-Day, you'd probably be forgiven for thinking that it's a console-quality cover shooter in a similar vein to the Gears of War series. Sadly, that isn't the case at all. It's really more akin to an on-rails arcade shooter. Keep that in mind if you want to avoid disappointment. Once you get past that hurdle, you'll quickly realize that it actually works surprisingly well at that. Spectacle plays a large part of the fun of a rail shooter, and as described already, its visuals do a great job at giving you that. Controls are all operated via the touchscreen. There are buttons for zooming in and pulling the trigger. You can also slide your finger around to rotate the camera, look around the area, and aim your sights on your trigger-happy foes. Finally, you can change your soldier's position with just a simple tap of your finger. Doing so is a tactical action that might give you a better spot to shoot the enemy from, but it also makes you vulnerable to gunfire while you're out of cover. The enemy AI isn't particularly bright and it can't perform a whole lot of actions either, but the shooting is still a load of fun thanks to the game's responsive controls. The shooting in particular is helped by the healthy variety of weapons you'll undoubtedly use over the course of the campaign. You'll fire the standard-issue M1 Garand rifle, throw grenades at enemies that are really hunkered down, use an RPG to blow up tanks and heavy fortifications, and even shoot planes out of the sky with a powerful mounted anti-air turret. Sadly, acquiring new weapons permanently can be a tad difficult if you don't want to spend money. Gold rewards are dismal and weapons are expensive. Fortunately, it's not entirely necessary to spend money on the game, but it's annoying that so much of the arsenal is gated behind a paywall. The movement in most rail shooters is a highly non-interactive affair. The camera pans around, zooms in on a new location, and stops at the next area that's swarming with bad guys. Frontline Commando: D-Day does away with this notion in a very interesting way: by adding some elements from the endless runner genre to the movement sections. Obstructions threaten the life of your soldier as he sprints from one covered zone to the next. These can include fallen trees that must be vaulted over, or even landmines that you'll have to weave around without slowing down. While these instances are brief, they suit the subject matter very well and help to break things up. It's also nice to see that the developers are seriously thinking about how to innovate the mobile gaming scene, which is often criticized for its vast array of copycats. Frontline Commando: D-Day includes over 100 missions across five campaigns that represent various operations in the historical Normandy landings. These include Operations Utah, Omaha, Sword, Gold and Juno. Each mission is bite-sized, can be completed in a manner of minutes, and usually includes a couple of optional secondary objectives for those seeking additional challenges. It might sound like there's a lot of variety to be found, but there's not as much as you would think. Play a few dozen missions, and you will start to notice that a lot of the maps are looking more and more familiar. Once again, your eyes are not deceiving you; the maps are being recycled. The enemy placements may change, your soldier may run to different locations, but the map is the same one you fought on five missions ago. Not only does it make things repetitive, but it really trashes the historical aspect to the game. It doesn't really feel like you're taking part in any major battles; it feels more like you're just running around a bunch of disconnected shooting galleries with WWII trappings. It doesn't help that the game not only forces you to shoot up the same maps, but it encourages you to repeat the same missions. In order to unlock campaigns, you need stars. To get stars, you need to complete secondary objectives in the missions. These usually consist of things like scoring headshots or finishing the level in record time. While they can be fun challenges, their presence means that you're only going to notice the recycled maps even more. Don't let the overuse of recycled environments deter you from what is one of the more well-made free to play mobile games on the market right now. Frontline Commando is still a fine title. It's got great shooting action, responsive controls, fantastic graphics, and even a little bit of innovation. While it clearly wants you to spend money to unlock the more exotic weapons, you can easily lose a ton of hours to this game without spending a cent. If you want to take a good shooting game everywhere with you, then you can't go wrong with Frontline Commando: D-Day.